During a recent vacation in Seattle, my husband and I took a bus to the Space Needle. As he looked for a seat, I did what I always do -- look at the book covers of those who were reading. Among the Lee Childs, Michael Connellys and assorted romance novels was one rider engrossed in Robert Randisi's In the Shadow of the Arch. I wanted to stop and ask this riding reader how he liked the novel, which is part of Randisi's Joe Keough series and is set in St. Louis. But the bus was crowded and seats needed to be found and, besides, the man was quite deep into the novel. 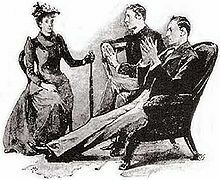 But it illustrates what I have always said, that no geography or region, even any subject, is out of bounds for mystery readers. Perhaps the man had visited St. Louis or was from the Gateway to the West. Or maybe he just wanted a good novel. With the St. Louis Bouchercon about to start, now's a good time to look at Missouri's Men of Mysteries. To call Robert Randisi prolific is an understatement. Even he has said he doesn't know how many novels and short stories he has written, though the number has been quoted as more than 500 novels. I'll just say that under his various pseudonyms he's written A LOT. Randisi's work include private detective novels, historicals, thrillers, science fiction and westerns, which make up the bulk of his books. His detective characters include Miles Jacoby, Henry Po, Nick Delvecchio, and Joe Keough. His latest is a series of "Rat Pack" mysteries such as Fly Me to the Morgue with Frank Sinatra, Sammy Davis Jr., Dean Martin and the rest of their pals as sleuths. He also has co-written a series with Young and the Restless actress Eileen Davidson, latest one is Swingin' in the Rain. Randisi's mysteries are straight forward p.i. or police procedurals with involving plots, full characters and a sense of the area -- all befitting the man who established in 1981 The Private Eye Writers of America, which gives out the Shamus Award. In the novels he sets in St. Louis, Randisi captured the nuances of his adopted city, not just the obvious like the Arch but the nuances of St. Louis such as the neighborhoods. 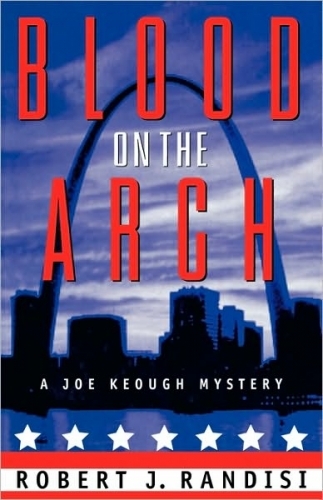 Randisi's St. Louis novels include In the Shadow of the Arch, Blood on the Arch, East of the Arch and Arch Angels, which was reprinted as Blood of Angels. There's a good reason why Randisi, along with John Lutz, will be honored during Bouchercon as Living Local Legends. John Lutz is the other Living Local Legend who will be honored during the St. Louis Bouchercon. Lutz also may be the most well-known of St. Louis authors, especially since his novel SWF Seeks Same was adapted by director Barbet Schroeder into the 1992 film Single White Female with Bridget Fonda and Jennifer Jason Leigh. But Lutz was known among those of us who appreciate good mysteries long before Jennifer Jason Leigh tried to make herself in Bridget Fonda. After all, the man has written more than 40 novels. That includes stand-alones, a variety of series including those novels with Fred Carver, Frank Quinn, and Alo Nudger, and enough short stories to fill several anthologies. His latest novel is Serial. 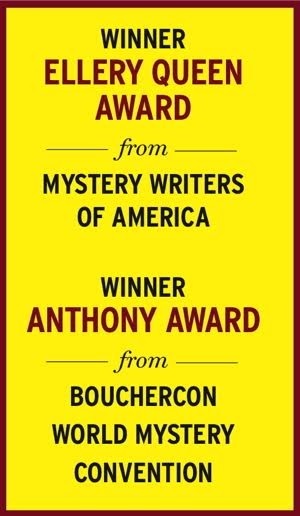 Among his awards are the MWA Edgar, the PWA Shamus, The Trophee 813 Award for best mystery short story collection translated into the French language, the PWA Life Achievement Award, and the Short Mystery Fiction Society's Golden Derringer Lifetime Achievement Award. Lutz's 2010 Frank Quinn novel Mister X has been nominated for a Shamus Award for best original paperback private eye novel. Winners will be announced in St. Louis at a private Private Eye Writers of America banquet. Although he has lived in St. Louis for decades, and is a part-time resident of Sarasota, Fla., Lutz generally sets his novels in New York City. I have always found Lutz's serial killers novels quite intriguing, stressing the plot and the characters rather than the gruesome. He uses the dramatic structure of a serial killer investigation to tell broader stories. Let's leave St. Louis for another part of Missouri -- Kansas City, the setting for Joel Goldman's legal thrillers about Lou Mason; the latest of which is The Last Witness, and his novels about former FBI Special Agent Jack Davis, the latest of which is No Way Out. As a former Missourian, I like both St. Louis and Kansas City. Though they are both in the same state, the two cities are vastly differently. Those coming to Bouchercon will get a taste of St. Louis. Each author brings a part of him or herself to the books they write. Goldman does this especially with his Jack Davis novels. Beginning with Shakedown (2008), Davis is coming down with a rare movement disorder that has come out of nowhere. Goldman also has this disorder and writing about it has helped him understand the disorder. Goldman writes about this on his website. Kansas City has a rich history. Great barbecue, a decent arts scene, good shopping and a sense of what makes a big city but with small-town amenities. Kansas City, both the Missouri and the Kansas cities, have long been a mid-way point for mobsters making drops from the west coast and Las Vegas. And, yes, Goldman has more of Kansas City history on his website. Goldman's family has lived in Kansas City for more than 100 years and he brings a sense of that history to his novels. Goldman's legal thrillers and the police procedures are well plotted with characters who are realistic.